The Dark Base Pro 900 Rev 2 is, as the name implies, a minor revision of the Be Quiet Dark Base Pro 900 that we already reviewed way back in the blue mat era.The major difference is the addition of a power supply shroud, similar to the one in the Dark Base 700 that we also reviewed, but there are also some other minor changes. Since the rest of the case is the same, we’re replacing our usual build and appearances section with a quick rundown of the updates we noticed. This review of the Be Quiet! Dark Base Pro 900 Rev 2 compares performance, build quality, and differences with the first version. We also test versus several other leading cases, including other full-towers or large PC tower cases. 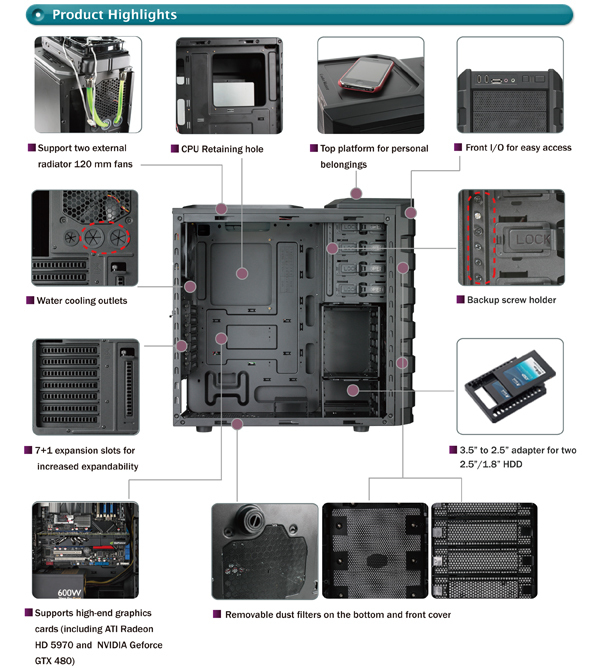 The newest Cooler Master Mastercase H500[X] case is the H500. Not the H500P, or the H500P Mesh, or the H500M. Just plain H500, but not the identically-named NZXT H500, or the H500i, or the Thermaltake A500 we saw at Computex, nor the Corsair 500D. If NZXT comes out with an H500 Mesh, we’re going to take matters into our own hands and start assigning names. The look of the H500X family was established by the H500P late last year, and the cases that followed all share the dual 200mm RGB intake fans and a similar front panel. The H500 steers further away from the original than the others, though: most obviously, the top of the case has an odd hump at the front, similar to the old HAF 912/922/932s. On the 912, this was advertised as a “top platform for personal belongings,” but it’s more practical on the H500, hiding a plastic handle for lifting the case. It’s not as bulletproof as a metal handle would be, but it’s fine for lifting the case onto a table, and these days that’s about the only reason anyone needs to pick up a PC. The H200i is the smallest of NZXT’s New H-Series, including the H400i, H700i, and different-but-technically-still-included H500. They’ve been out a while now (with the exception of the H500i), but the cheaper non-i versions are what’s actually new -- the “i” suffix, of course, denotes that it includes an NZXT Smart Device. We were sent an H200i and not an H200, but we won’t be covering the device in this review for a few reasons: we already made our initial feelings about it clear, and a version of the case is sold without the device (so it’s optional, which is what we wanted). Finally, we’ve been told that the device has been improved and plan to revisit it in a separate piece. For now, value remains higher with the barebones cases, which are functionally the same in build and fan/airflow arrangement. This review of the NZXT H200 (and subsequently, the H200i) looks at value proposition of the mini-ITX mini-tower. The H200 isn’t a truly small form factor (SFF) HTPC case, like the SilverStone Raven RVZ03 might be, but it does fill a market for mini-ITX users who want more cooling or cabling room to work with. Corsair recently tried to address a similar market with its 280X micro-ATX case, which we primarily remarked as having good quality, if odd positioning for its size. The H200 likely falls into the same territory for most. This is something we haven’t seen before. NVidia has taken a relatively successful card, the GT 1030, and has implanted DDR4 in place of GDDR5. It’s actually getting system memory on it, which is a tremendous downgrade. The memory bandwidth reduction is several-fold, dropping from 48GB/s to about 16GB/s with DDR4, but the part that’s truly wrong is that they used the same product name. The GT 1030 has always been an interesting product, and that’s only true because of the mining boom and GPU scarcity issues of earlier this year. Typically, the GT 1030 – or similarly ultra-low-end cards – would not get our recommendation, as a GTX 1050 or RX 550 would make more sense and be close in price. Earlier this year, even GTX 1050s and RX 550s had evaporated, leaving only overpriced GT 1030 GDDR5 cards (that we were somewhat OK with recommending). Fortunately, performance was decent. Was. Before the DDR4 surgery. It’s time to benchmark the GT 1030 versus the GT 1030 Bad Edition, which ships with DDR4 instead of GDDR5, but has the same name as the original product. In a previous rant, we railed against these choices because it misleads consumers – whether intentionally or unintentionally – into purchasing a product that doesn’t reflect the benchmarks. If someone looks up GT 1030 benchmarks, they’ll find our GDDR5 version tests, and those results are wildly different from the similarly priced GT 1030 DDR4 card’s performance. On average, particularly on Newegg, there is about a $10 difference between the two cards. The GT 1030 with DDR4 is one of the most egregious missteps we’ve seen when it comes to product marketing. NVidia has made a lot of great products in the past year – and we’ve even recommended the GT 1030 GDDR5 card in some instances, which is rare for us – but the DDR4 version under the same name was a mistake. SilverStone’s RVZ03 isn’t new, but after years of ATX case reviews we have quite a backlog of promising small form factor cases. 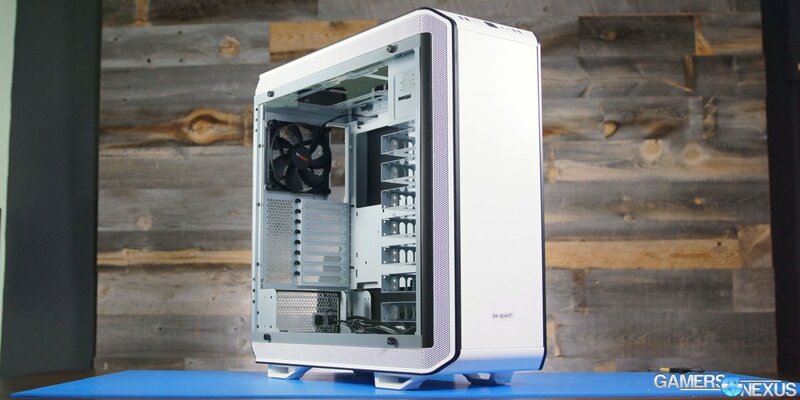 The RVZ03 is part of the Raven line, a loosely related group of “extreme enthusiasts chassis” that could also be called “the ones that have a V-shape on them.” We recently revisited the RV02, one of the best-performing full size cases we’ve reviewed. It’s a thin, console-like enclosure, typically shown standing vertically, but also capable of being laid on its side Taku-style. The ubiquitous Vs on the front are clear plastic backlit with RGB LEDs hooked up to a controller; the controller can accept input from a standard 4-pin RGB header and includes adapters to control normal LED strips as well. The review embargo on Corsair’s new Crystal 280X micro-ATX case lifted during Computex, possibly the busiest week of the year--but since we’ve just started testing small form factor cases, we chose to push back the review another week or two. The 280X is fairly large to call itself small form factor, and that can be an unfair advantage when comparing performance against truly small mini-ITX cases like the SG13. One justification is that (unlike the Cryorig Taku), the 280X uses its extra room to supports full-size components except for the motherboard, which must be either micro ATX or mini ITX. Getting this cooler working was a bit of a struggle. It was some parts human error, on our end, and some parts mechanical error. This thing is a $100 cooler from Aliexpress, and it uses both open loop liquid cooling for a few of its pipes while also using traditional air cooling and heatpipes. We had some small (read: significant) leaks during our livestream, and after the stream, we discovered that the screws securing the inlet manifold to the tower were loose, causing significant leakage as the water filled the pipes. After fixing this, we were finally able to fully test this truly unique hybrid water-air cooler. The cooler is an interesting one. We’re planning a separate tear-down of the cooler to see what’s going on under the coldplate – likely not much – but for now, we’ve done exhaustive thermal testing under various conditions. Some tests were just straight pump/reservoir hookups to the cooler, while others included a 360mm radiator and 3 high-end fans. The W120 has been sitting on shelves for a while, clearly, as it was first shown at Computex 2011, and the box we received had dried thermal paste and yellowing on the product box. We still wanted to test it, as the unique combination of G-1/4” fittings, open loop support through 4 water pipes, and traditional air cooling meant the cooler could perform peculiarly. You’d assume that there’s a reason this isn’t really done, but we still wanted to find out why. NZXT opened their revamped H series of cases a few months ago with the H200i, H400i, and H700i, which are all mostly differently sized versions of the same case. The H500/H500i is a brand new addition--no, not that H500--and NZXT has made some tweaks since the first batch. The NZXT H500 is an S340 replacement, priced at $70 MSRP for the H500 and $100 for the H500i (which includes a “smart” device and RGB LED strips). We liked the H700i overall, but we had some criticisms, mostly about the “i” representing the included smart device. NZXT told us they listened, so let’s start by checking off those earlier complaints. It’s been a long time since we’ve reviewed any mini-ITX cases. The standard system that we use for testing ATX cases includes a full-sized GPU, PSU, and CPU cooler, which may or may not fit in small form factor cases, as well as an ATX motherboard that definitely won’t. Even if our components were small enough to fit, ATX and mini-ITX enclosures are like apples and oranges--SFF cases often have specific uses and different priorities than standard mid-towers. Enough time has passed that it’s worth it to put together a separate ITX benchmarking system with a separate table of results to compare. To start off our database, we’re doing a roundup of three not-so-new cases from our backlog: the Thermaltake V1, Silverstone SG13, and the Cryorig Taku. This will start our charts, and we intend to work toward expanding those charts with the full suite of cases, as usual, including several upcoming products at Computex.